Gunshots in a sanctuary of peace. Cries of terror where people sing God’s name. Blood in the prayer hall. A community shaken by hate but coming together to sing, pray and forgive even before they’ve laid the dead to rest. This is what happened three years ago in Oak Creek, Wis., when a white supremacist opened fire in a Sikh house of worship on a Sunday morning and killed six people. 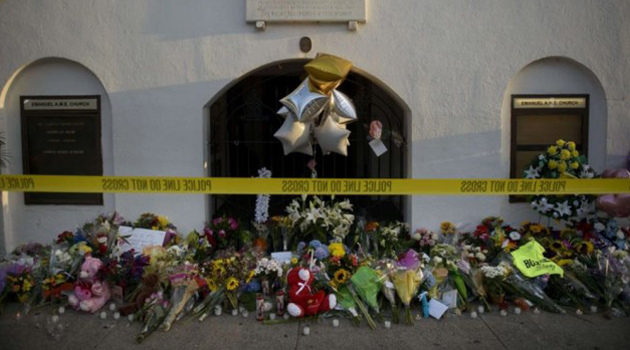 It was one of the deadliest attacks on a faith community in the United States since the 1963 Birmingham church bombing that took four little girls – until Charleston. Monday is the day of the final funeral of the nine black Americans murdered in Mother Emanuel church in Charleston, S.C. Since the shooting, the nation has mourned together. Thousands have gathered in vigils, and nearly 10,000 have sent prayers and messages of solidarity to Charleston. As a Sikh American who lived through the aftermath of the shootings in Oak Creek, I have been shedding familiar tears. The mass shootings in Charleston and Oak Creek were both carried out by white supremacists. They are not isolated incidents but part of a long history of racial terror on black and brown communities throughout U.S. history. Whether inside a black church or Sikh gurdwara, bloodshed in sacred spaces is especially heinous, because it strikes at the soul of our communities. “The perpetrator was caught, but the killer is still at large,” said the Rev. William Barber II. Dylann Roof has been apprehended. But the cultural and legal forces that produced him and others like him remain strong. However, we are not helpless before the forces of racism. After the last body is buried Monday, we can honor the dead by shaking off despair and taking bold concrete action. The first step is to remember the story of Oak Creek as a source of hope and inspiration. On Aug. 5, 2012, the Oak Creek massacre brought anguish and grief to Sikhs across America and around the globe. Many Sikhs wear turbans to show our commitment to our faith and the path of love, equality, and service. Yet our turbans and brown skin have marked us as targets for hate, profiling, and violence, especially since 9/11. Even after a century in the United States, our stories had never entered mainstream consciousness. In the wake of the Oak Creek shooting, the nation’s spotlight fell on the Sikh community for a brief moment. Facing the sea of cameras, Sikh Americans, including sons and daughters who had just lost their parents, shared the message of our faith: We are One. In response, people gathered in candlelight vigils across the country and sent thousands of prayers of love and support to the victims’ families. This act of solidarity mattered. It emboldened our community to show the rest of America the Sikh spirit of Chardi Kala – relentless love and optimism even in suffering. I remember when family members reentered the gurdwara when it was still a crime scene. With prayer on their lips, they rolled up their sleeves, ripped out blood-soaked carpets, and repaired shattered windows, rebuilding their community with their own hands. Then – like the brave men and women of Mother Emanuel Church last Sunday – they prayed for the souls of every person who died, including the gunman. But there were few media trucks left in Oak Creek to tell this story. Mainstream media had dropped coverage of the mass shooting after a few days, sending a signal that the deaths of turbaned, brown-skinned Americans were not worthy of more attention. Worse, the U.S. government had not documented the lives of the people killed. Despite our community’s requests since 9/11, the FBI did not collect data on hate crimes against Sikhs and other minorities. But we didn’t lose faith. Sikh advocates reached out to the thousands who had mourned with us – and organized. We held the first congressional hearing in recent U.S. history on the threat of homegrown domestic terrorism. We launched a national campaign to call on the government to change federal hate crimes policy, coordinated by the Sikh Coalition. We took our fight to Capitol Hill backed by thousands who signed online petitions – and won. Three months ago, the government began tracking hate crimes against Sikhs, Hindus, Arabs and others. To be sure, it took all our resources to add boxes to a form – but it was a vital step toward protecting all communities from hate. Today, the Charleston tragedy calls us to take the next steps together to combat hate in our country. After we take down the Confederate flag on the state house in South Carolina, we must end the era of venerating all symbols of white supremacy. We must challenge racial profiling embedded in our criminal justice, national security and immigration systems. We must demand more federal resources into monitoring homegrown domestic terrorism. Above all, we must take the small but courageous steps in our own lives to see people who do not look like us as brothers and sisters. On the day of the Oak Creek shooting, Lt. Brian Murphy was the first police officer on the scene. He engaged the gunman, took 15 bullets, and nearly died protecting my people – people who didn’t look like him. So as a Sikh woman, I choose to mourn the black men and women killed in Charleston as my own brothers and sisters. Then I light a candle and call forth the spirit of Chardi Kala, relentless optimism. Because today we mourn. Tomorrow we organize.